Do you own a shotgun for home protection? Does your shotgun have a light mounted to it? Have you thought about adding a light to your shotgun? If you are in the market for a shotgun light you want to make sure you find the best. Keep on reading to find out what makes the best shotgun light. What is a Shotgun Light? Most firearm experts agree shotguns are a great choice for home defense. Whenever you point your gun at something you want to be fully aware of what you are pointing at. You want to know what is behind your target. Knowing what is behind your target is often impossible when searching dim or dark rooms with a shotgun. Mounting a light to your shotgun will let you see what is behind your target. Knowing who your target is and what is behind your target is important. You don’t want to accidentally shoot a friend or family member because you couldn’t see. Having a shotgun light mounted to your shotgun allows you to see, but also disorients attackers. Shining a bright enough light directly into their eyes will hopefully scare them off so you won’t have to fire a shot. Now that you know how useful a shotgun light can be it’s time to go out and get one. The truth is there are so many good shotgun lights on the market how do you know what the best ones are? In this article, we talk about 4 shotgun lights that we feel are the best available. To give you an idea of what we look at when considering what ones are the best here are the things you need to look for in a shotgun light. Shotgun lights are used in life or death situations. You want something that is going to be bright enough to show you what is in front of you. Shotgun lights should also have the ability to temporarily blind a potential attacker. You want to blind them before they can see you. Look for shotgun lights that offer 500 lumens or more. You want something that you can rely on in a life or death situation. You don’t want a light that is going to stop working after the first few uses. Avoid lights that clip onto the barrel because there is no guarantee they will remain in place. Durability can often go along with reliability because you want something that is going to last. A light mounted on a shotgun needs to hold up to the blast of the shotgun. You don’t want a light that is going to crack, fall off, or even stop working the first time the gun is fired. You are going to be using the shotgun light for self-defense. Like handheld tactical lights, you want to find a shotgun light that offers multiple modes. Strobe mode gives you the ability to blind and disorient potential attackers. Lasers are great for keeping your night vision, while still lining up your target. Just remember regardless of the mode being used remember wherever your point your light you are also pointing your gun. To be a shotgun light the flashlight must have the ability to mount onto your gun. Look for lights that come equipped with Picatinny rails or glock-style rails. The easier the light is to mount the better. Manufactured from machined aluminum with a black anodized finish the Streamlight TLR-1 is available in three different colors. Powered by two CR123A batteries the Streamlight 69620 TLR-1 HL features a C4 LED capable of emitting up to 800 lumens. The beam produced by this best home defense shotgun light offers a peak beam intensity of 15,000 candelas. The TLR-1 HL features an ambidextrous switch that is used to provide power to the light, as well as enable and disable the programmable strobe. You will be relying on the TLR-1 HL in life or death situation so how far the beam reaches is critical. The concentrated beam provided through the TIR lens reaches up to 800 feet. The completely sealed lights feature an IPX-7 rating making it perfect for indoor and outdoor use. The TLR-1 HL is able to mount to any handgun with glock-style or Picatinny rails. Designed for handguns, the TLR-1 HL can also be mounted to long guns with the purchase of an additional kit. The SureFire X300 Ultra powers a high performance LED with two high-energy CR123A batteries. These two batteries will emit up to 600 lumens of light for a period of an hour and a half. The X300 Ultra features a newer mounting system that uses a T-slot mounting system with a T-slot mounting rail and tightening screw. This system allows users to mount the X300 Ultra to both long guns and handguns quickly and securely. The SureFire X300 Ultra LED earns its title as best tactical shotgun light due to its durability and user-friendly interface. The X300 Ultra LED utilizes an improved ambidextrous switch. 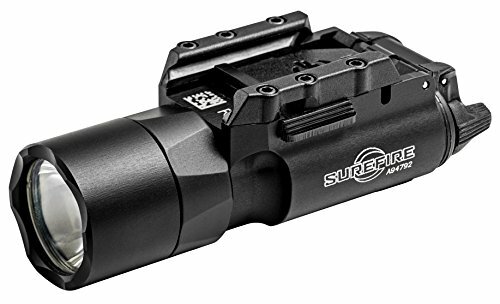 The improved switch is wider and shorter than what you have seen on other SureFire models. Located towards the rear of the light the switch allows for one-handed operation. Remote activation for handguns and long guns are also available with the SureFire X300 Ultra. Using a C4 Led the Streamlight 69261 TLR-2 HL emits 800 lumens of bright white light. 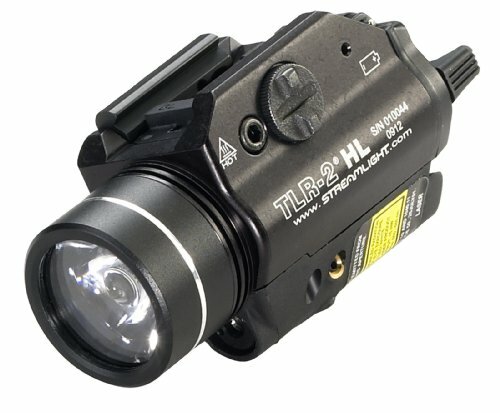 Powered by two CR123A batteries that last for 1.75 hours, the TLR-2 HL is bright enough to blind any potential attackers. 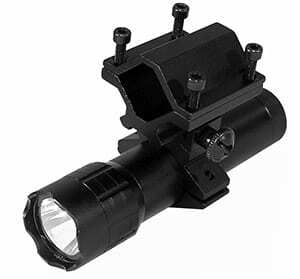 The TLR-2 HL offers a wide beam pattern allowing it to be used effectively when searching through dark rooms. 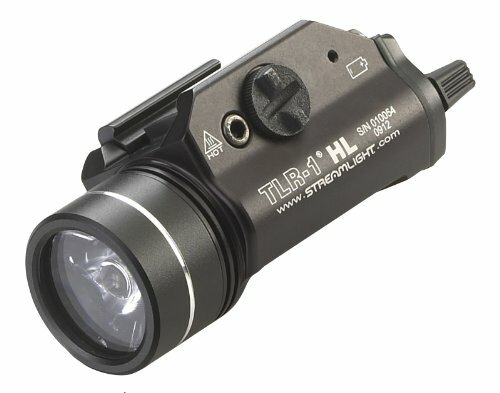 The Streamlight TLR-2 Hl is very similar to the Streamlight TLR-1 that we mentioned previously, but offers a few upgrades. The TLR-2 HL features a red laser option. If just the red laser is used the CR123A batteries will last for 45 hours. The light mounts to any handgun equipped with Glock-style or Picatinny rails using a rail grip clamp system. The system can be securely attached and detached with no tools. The way the light mounts to the gun your hand will never go in front of the muzzle. The ambidextrous toggle switch allows for one finger operation for constant and momentary on. The strobe feature is controlled via a double tap to the left side switch. The Streamlight 88850 PolyTac LED offers a light that can be used for a broad range of applications at an affordable price. The Streamlight 88850 utilizes a C4 LED to emit up to 275 lumens of light. Powered by two CR123A batteries the Streamlight PolyTac uses TEN-Tap programming to provide users with the choice of three operating modes. Each operating mode is accessed via the tactical tail cap switch. 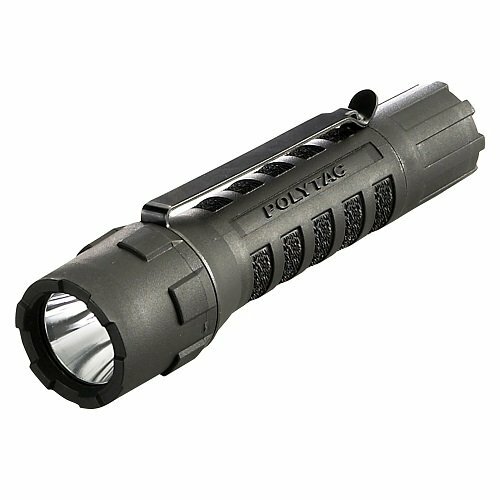 The PolyTac LED features solid state power regulation to provide users with maximum light output through the entire battery life. The Streamlight 88850 PolyTac is a handheld light that can be turned into a shotgun light. Being a handheld light it does not come with a mount for a shotgun. If you plan to use the Streamlight 888850 PolyTac as a shotgun light you will need to purchase a mount for it. We strongly recommend the Monstrum Tactical 1” Offset Picatinny Rail Mount. If you are going to rely on a shotgun for home defense you need to invest in a shotgun light. Shotgun lights allow you to see who your target is and what is behind your target making the shotgun far more effective. If you are going to add a shotgun light you want to choose the best shotgun light on the market. The best shotgun lights are going to be bright enough to disorient potential attackers. The best lights are durable and reliable. They will come with multiple modes and have the ability to easily mount to your shotgun. All of the lights we included in this article meet the requirements we set forth for the best shotgun light. The first three lights mentioned are a bit higher priced than the last light, but that is because they are extremely reliable in life or death situations. The fourth light is the best choice for those who need something they can rely upon without going over budget. The only downfall to the PolyTac is you have to purchase the mount separately.